Bab and Betty are busy setting up a doll-party under the shade of the lilacs. Their mom even prepared a yummy cake for the party. But little did the girls know what a pleasant surprise was awaiting them and a new set of friends they were going to win at the end of the party. They meet an adorable poodle quite dexterous in the multiple impressive feats he could perform, and Ben his master. Ben is a lost young boy, who ran away from the circus to escape his mean old boss, Mr. Smithers. Moved by the boy’s state Mrs. Moss (the girl’s mom) takes him in and helps him find a job. Having lived in the circus, Ben knows his way around animals, and possesses the expert skill of intuitively understanding them. Soon, the lovely Miss. Celia engages him under her employment to take care of her horse and give company to her pompous brother. The young children form a wonderful bond of friendship as they help each other out of scrapes and help Ben make a home in their quaint town. 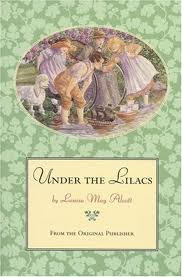 It goes without saying that a children’s book by Louisa May Alcott has to be endearing. The characters and their little adventures evoke wonderful childhood emotions. Wrapped in the story, children can find many a little lesson on friendship, trust, kindness and humanness. It is a world painted with innocence and purity that one would wistfully wish all grown-ups in the real world would be as sensible and kind as in the story. It’s almost a mini-utopia. Stories set almost a century back show the value of a close-knit community, and the symbiotic relationship that prevailed among the people. Everyone knew each other, and were almost one big dependable family. Of course, the skeptical part of me was on the verge of being tired of the over-the-top sweetness of the story, but in the end, my love for such warm and cozy tales won over. The writing is beautiful - any adult can read this book just for the good writing, even if they don’t care much for a children’s story. This is yet another book that young children (or young adults) would delight in reading.